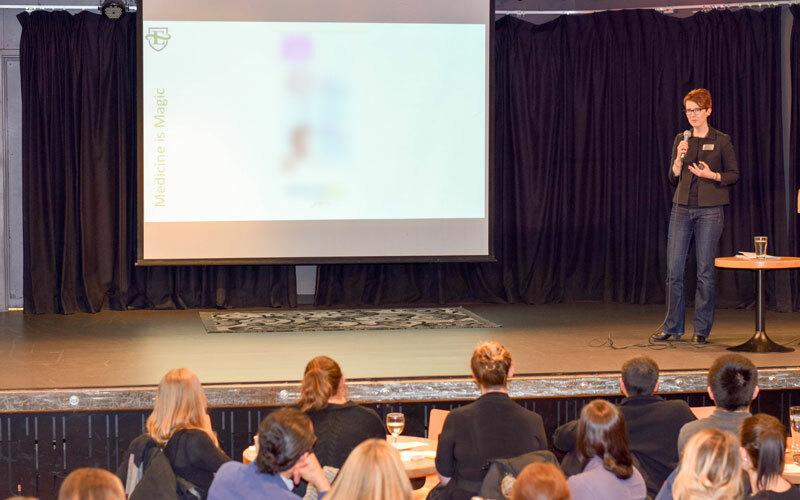 A group of students and professionals from the Saskatoon business and health sciences community attended the second annual Science of Marketing Pub Talk. Hosted by the Master of Science in Marketing program, the second annual event showcased Edwards Research Scholar and Associate Professor Dr. Marjorie Delbaere. The topic of focus was the research behind marketing a controversial product. Since the mid-1980s, researchers have witnessed exponential growth in advertising prescription drugs directly to consumers. In spite of this dramatic growth in the consumer sector, pharmaceutical companies still spend even more money marketing drugs to physicians. Drugs ads, both those directed to consumers and those directed to physicians, frequently contain vivid metaphors, alongside sometimes-dire warnings of side effects. Dr. Delbaere took the audience on a brief tour through the fascinating world of marketing medicine with real-life examples. She challenged participants to think of their own experiences with prescription drug marketing in print magazines, the web, television, and more. Dr. Delbaere’s presentation sought to answer the following questions: Why aren't drug ads purely informational? How do consumers react to these persuasion attempts? Are doctors presented with different messages? How are pharmaceutical marketers using social media? For those interested in researching similar topics related to marketing, Dr. Delbaere also encouraged the audience to consider the Master of Science in Marketing program offered by Edwards School of Business. To learn about upcoming information sessions and admission requirements, please visit edwards.usask.ca/mscmarketing.